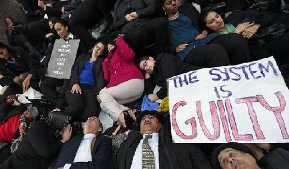 A coalition of lawyers, law students, and others acting in solidarity protested police killings of unarmed people by staging a die-in outside Stanley Mosk Courthouse on the raining morning of Tuesday, December 16, 2014. 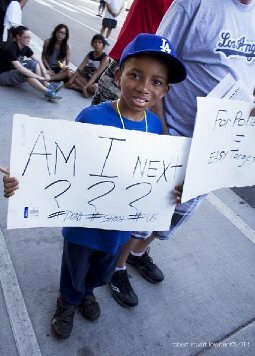 The call to action encouraged others "to protest these police killings, the failure to hold police accountable for these deaths, and the system that perpetuates these racist practices. We act in solidarity with others taking action to show that Black Lives Matter." On Black Friday, three demonstrations against Hewlett-Packard occurred in front of large stores in Greater Los Angeles. 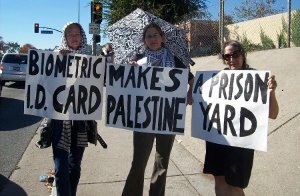 Besides its involvement with Israel, HP is involved in government surveillance of citizens around the world, including in the U.S. About a dozen people turned out for each of the two-hour demonstrations. LOS ANGELES--People assembled the morning of November 5, 2014 outside Los Angeles City Hall to participate in the worldwide #Anonymous Million Mask March. 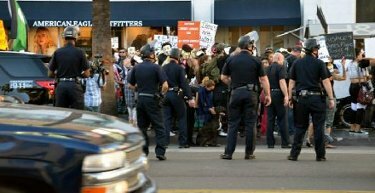 Signs bearing the messages "We Don't Want to Live in a World Government for the Corporations" and "Occupy Love" were among the dozens on display.
. . . As the march moved into the open space of the shopping mall at Hollywood & Highland, LAPD officers ringed the protest in pairs. Private security officers also came out to confront the masked masses, who continued dancing and waving signs. By remaining in one place for over a half an hour, the scattered participants were able to reunite, and the march was hundreds strong as it resumed down the Walk of Fame. @LAPDHollywood tweeted "Please avoid Hollywood Blvd near highland due to protest" around 1:30 PM. LAPD Media Relations advised CBSLA.com "An anti-police brutality protest shut down a stretch of Hollywood Boulevard. More than 100 protesters took part in the march."